The latest renderings unveiling the future of the Monte Carlo resort have been revealed during an earnings report for MGM Resorts International. And a local Town Board Meeting has provided some extra context for the massive transformation of the 21-year old property into the Park MGM and NoMad Las Vegas late next year. 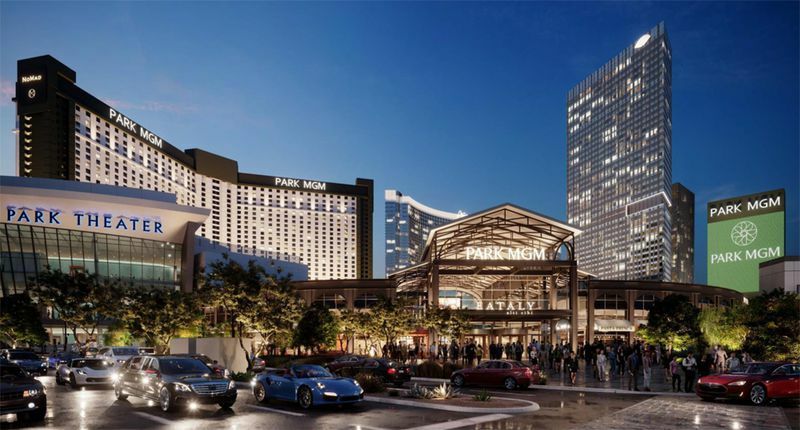 Now confirmed, Eataly will fill approximately 40,000 square feet on the southern edge of the resort and The Park-facing side will become the main pedestrian entrance into the Park MGM casino. The current Las Vegas Boulevard frontage will be stripped of reminders of the Monte Carlo layout. Guests will be encouraged to walk round the corner to this new entrance and even if they don’t head inside, they will be tempted by four, semi-permanent food carts operating near the front doors. New benches will added to permit al fresco dining. Already promised from Eataly, a “vibrant marketplace with cafes, to-go counters, and sit-down restaurants interspersed with high-quality products from sustainable Italian and local producers,” known to include pasta dishes, pizza and a bakery. The future signage includes the phrase, “Alti Cibi,” an Eataly motto they translate as “high food.” MGM Resorts International Chairman and CEO Jim Murren confirmed during the earnings call that the new hotel will also have lofty ambitions, with daily room rates on the “upper end” of the MGM hotel portfolio. The renderings show the new edge of the building curving its way toward the Strip, removing the still in business, 13,000-square-foot corner resident, Diablo’s. The computer drawings indicate both the “Mexican cantina” and neighboring tenants BLVD Creamery, Sambalatte and Minus5 are either in the way, or need to be artfully integrated into the Eataly space.